How to Transfer iTunes Music to Android Phone and Tablet on Mac? Enjoy any iTunes Music on any device, - anywhere! Convert iTunes Music to MP3 on Mac OS X for play on Android devices. How to Transfer iTunes Music to Android Phone on Mac? An easy way to get your iTunes music to play on Android phone and tablet freely. If you have an Apple computer, then you must be familiar with iTunes. Because you need to use it buy and play music and videos on your Mac operating system. And as we all know, these iTunes music can be synced with iPhone, iPad and iPod easily for the reason that they are all the production of Apple. But here comes to a problem, are all Mac users using iPhone? The answer is absolutely not. According to the survey, although most of Mac users have iPhone, there are still a large group of people with MacBooks and Android devices. Then, for these Android users, they always get into trouble when they are trying to transfer iTunes music to their Android phones and tablet PC, Due to the fact that the music you buy via iTunes is DRM protected, iTunes music can only be transferred into iOS devices and limit the quantity of available devices. So the users generally have no solution to play iTunes music on their Android phones or Android tablet. This problem really easy to make users feel angry and get mad. They spend the money in buying favorite music by iTunes, but they can not enjoy these songs on their Android devices. If you meet this problem, please never be angry. 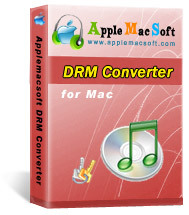 Because this problem can be easily solved by using AppleMacSoft DRM Converter for Mac. This iTunes music conversion software can help you to legally unlock DRM music and convert protected iTunes music to MP3, M4A, AAC or other audio formats, so that you can transfer these converted music from Mac to your Android devices such as tablets, smartphones, etc. and enjoy the music anywhere in anytime. 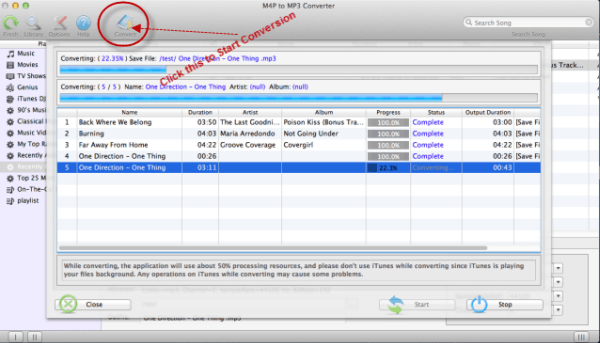 In addition to convert iTunes protected music, it also can convert unprotected music and audiobooks to MP3, M4A, AAC, M4R, etc. First of all, get the trial version of the program to have a try. For Windows users, please Click here to download Easy DRM Converter. Step One: Launch DRM Converter for Mac. You will see the following main screen after launching it. And your iTunes will be launched automatically. Step Two: Select music you want to convert and choose the output format. Click the iTunes playlist on the left side and you will see all your iTunes songs appear. Now you can click the songs you want to convert by checking the box. Please note that you can select several playlists or multiple audio files or entire albums at the same time for batch conversion. This will help you save time instead of waiting conversion one by one. Then in the bottom of the main interface,you can choose the output format and saving destination. 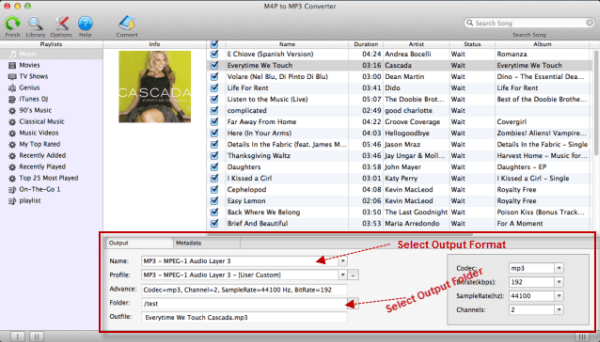 In order to output songs for Android phones, you can choose MP3 or WMA as the output format. Step Three: Start converting iTunes music. When all options are set, you need to click the “Convert” icon, then the program will start to convert iTunes music on Mac for android Phone. After the conversion is finished, you will see the output music in the folders you have chosen. After you get the output music files, connect your Android device to Mac via the USB cable, and Make sure USB Mass Storage mode is enabled on your phone or tablet. Now you can transfer these musics into your Android phone or Android tablet via USB and you will find that the music can be played in your Android phone without any restrictions. You can immediately download the latest version of AppleMacSoft DRM Converter from this web site and start to converting iTunes Music to MP3 for play on Android devices right now! Transfer iTunes Music to Android Phone on Mac.